TomTom GO 610 World is a car sat nav with World maps and a 6-inch touchscreen. This TomTom provides Traffic Information with a connection to a Smartphone. My Drive feature enables you to plan your route and view traffic before sending your chosen route to your TomTom sat nav. Advanced Lane Guidance helps you at every road junction. On screen buildings and landmarks also help recognise where you are and see where you should be turn. The speed camera database is included for the Lifetime of your TomTom satnav. TomTom GO 610 World has been discontinued. 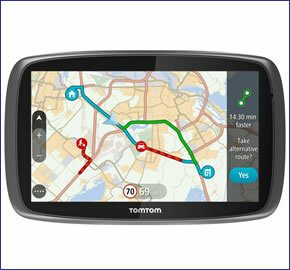 The TomTom GO 610 World is a car sat nav with a 6 inch touchscreen. The screen provides pinch, zoom and swipe technology making control of your sat nav very simple and efficient. World mapping is included with the TomTom 610 which includes UK, Europe, USA, Canada & Mexico, South America, Africa, Australia, New Zealand, Southeast Asia and the Middle East. You will receive real-time traffic information with the TomTom 610 using a connection via a Smartphone. Displayed on screen the TomTom will show you where the traffic delays start and end. You can then choose to be rerouted around the traffic congestion avoiding delays to your journey. "Quick Search" feature starts to find your chosen destination as soon as you start typing. Plus the TomTom 610 is quick to calculate your best route and should you take a wrong turn recalculation of your journey is also quickly made. There is also quick navigation options to your favourite locaitons, home address and work address; Simply tap the screen and go. The TomTom 610 has a My Drive feature which allows you to plan you route on a smartphone, tablet, PC or laptop. You can also view traffic information before you travel. You can then send your chosen journey information to your TomTom sat nav. Advanced Lane Guidance helps you ensure you are in the right lane at each junction. This is particularly useful on busy, complicated Motorway junctions. Buildings and landmarks will also be displayed on the screen making navigation more intuitive though recognition of where you are based on the buildings on-screen. Speed camera locations database is available for the lifetime of your TomTom product. You will know where the fixed and mobile speed camera locations are which will help to protect your driving licence. Each TomTom driver can share new speed camera locations via their sat nav device. The speed camera coverage includes 36 countries across Europe. Updates are available in real-time and twice weekly via MyDrive Connect and TomTom HOME. The battery life of the TomTom GO 610 World is up to 2 hours. QuickGPSfix ensures your sat nav always finds satellites quickly meaning you can start navigating soon after switching the unit on. Voice activation on the TomTom 610 makes controlling the device easy with your hands-free. There is a magnetic Click and Go Mount making installation and removal of the TomTom 610 very simple, quick and easy. Do you have a question about the TomTom GO 610 World that's not been answered on this webpage? Please see our car sat nav FAQs for questions from other customers and visitors. Plus if the answer to your question isn't featured, use the online form to ask us for the answer. Alternatively please telephone 01733 777623 Monday to Friday (9:30am-5:00pm) to speak to one of our sales team. TomTom GO 610 World has been designed to be a portable plug and play device, and as such can be transferred from vehicle to vehicle with ease by the user. TomTom GO 610 World is powered with a 12-volt USB Cable and Cable Charger (supplied) and attaches to your vehicle via the TomTom GO 610 World Click & Go mount. Additional mounts can also be purchased. Africa, Australia, Europe, Middle East, New Zealand, South America, Southeast Asia and USA, Canada and Mexico. Detailed coverage: Andorra, Austria, Belgium, Croatia, Czech Republic, Denmark, Estonia, Finland, France, Germany, Gibraltar, Greece, Hungary, Ireland, Italy, Latvia, Liechtenstein, Lithuania, Luxembourg, Madeira, Malta, Monaco, The Netherlands, Norway, Poland, Portugal, Romania, San Marino, Slovakia, Slovenia, Spain, Sweden, Switzerland, Vatican City, Cyprus, United Kingdom (including Channel Islands). Partial map coverage: Bulgaria, Cyprus, Montenegro, Russian Federation, Serbia and Turkey. Connecting Roads: Albania, Belarus, Bosnia-Herzegovina, Macedonia and Moldava. Looking for genuine accessories and spares for the TomTom GO 610? All parts availble to buy from ActiveGPS are genuine TomTom product and specifically designed for use with the GO 610 World. Accessories available to purchase include a travel case, travel case, replacement windscreen mount and a beanbag dashboard mount. View all of the TomTom GO 610 accessories.